We are SOOO happy. Why? Because Jason start to pee and make his heavy drops in the potty. Yippee.... Not only once but LOTS of time hi hi hi hi... In the morning, he called me that he wanted to pee in his potty. When he said it was finish, I saw there was something out in his potty. He was pee. We gave him applause and big hug. He was happy and smile in his face. He did pee but not much. Because we could see how afraid he was but still he pee couple times in his potty. We gave him stickers as well and he was happy. I bought Disney's stickers couple days ago. Around 1o am he said he wanted heavy drops as well. 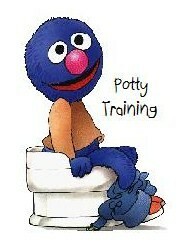 We gave him the potty and his sat. It was not easy, but finally he made it. After the third times, he had a BIG heavy drops hi hi hi hi... Because of that, hubby gave him balloons. Now, we have plenty balloons in our living room ^__^. We are happy and it is just start...... Jason is 2 years and 7 months at the moment. Rejoice !! I'm so glad to hear that ! !